Wow, love this! The whole outfit, hair and shoes are all perfect together. Definitely one of my favourite looks from you! love everything about this, especially the tie neck blouse! LOVE the gothic feel! What a great dress! cute dress! i didn't know NY had a buffalo exchange. i thought they only had it in philly.. i got a couple of great deals from them before! This dress is amazing and fits you beautifully! I love the shirt with the ascot underneath...it really compliments the dress! You look amazing! I love the whole vibe of the outfit and environment. Very poetical. Nice to have you back. Perfect as usual. This is so cute! Perfect for work. you look awesome and good job with your hair! I love reading about all the fun at the Weardrobe conference! 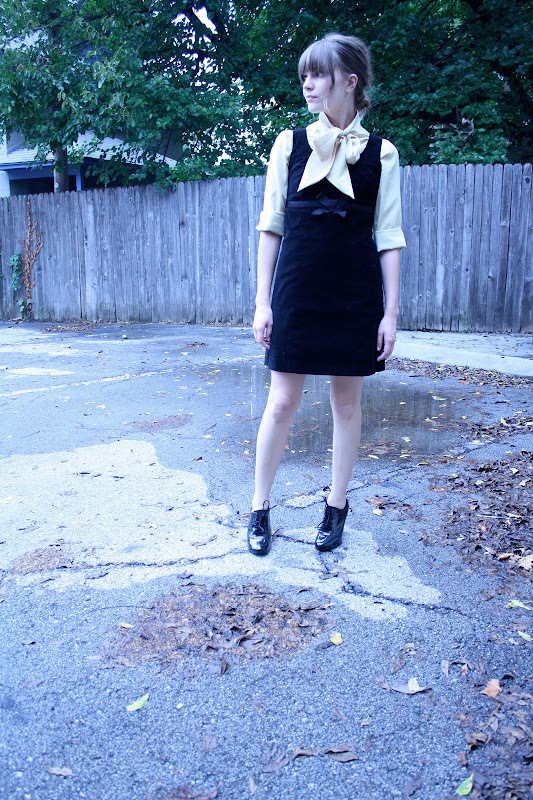 This outfitt is very young Marianne Faithful, love it!!! I don't know if you've checked out her style from back in the day, but if not I think you'd find it very inspiring. gorgeous photo. sounds like you all got some great finds in NYC during the conference...can't wait to see all the goodies! This is great, very 1970s-secretary chic! this look is freaking great. seriously, you are one of my favourite style bloggers - all of your clothes are in the sort of budget I have, and you still look amazing. I love this! Need some shoes like this. Awesome look you did PERFECTLY!! i am copying this outfit (and then of course giving you credit for it)! you look so great! i love it. and i miss the weardrobe conference.